Wildlife-vehicle collisions are a big deal for anyone travelling in Greater Yellowstone. These tragedies are scary, expensive, and sometimes fatal. Yellowstone’s wildlife need to cross many roads as they travel to and from their winter and summer ranges. As these roads get busier, wider, and faster, it becomes nearly impossible for wildlife to cross. And, if they can’t make it to their seasonal ranges, we’re in danger of losing large populations of wildlife. We need your help telling the Idaho Transportation Department to build wildlife overpasses and fencing to secure safe roads for people and wildlife on Targhee Pass. Elk crossing a busy road in the Greater Yellowstone Ecosystem. Science has shown that there are viable solutions that both increase drivers’ safety and allow wildlife movement. 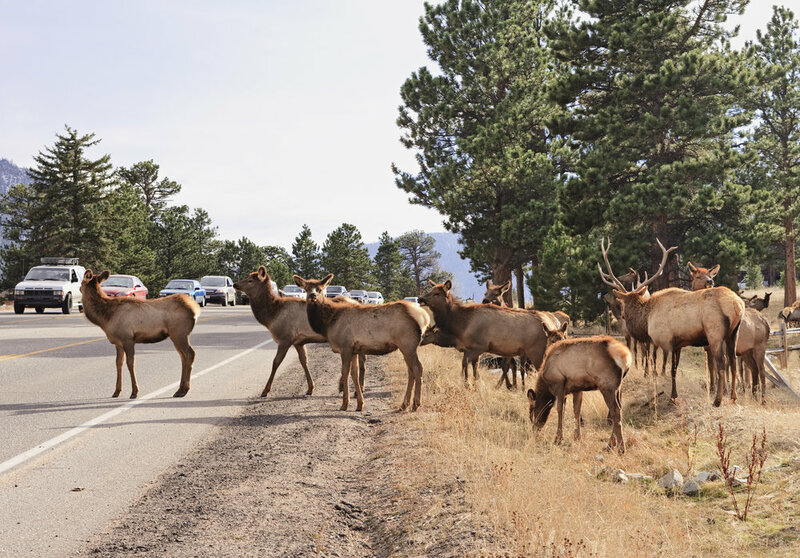 Wildlife overpasses and fencing, like those in Pinedale, Wyoming, and Wells, Nevada, reduce wildlife vehicle collisions by 83-87% and allow wildlife to migrate. Today, you can ensure safe highways for both drivers and wildlife in Idaho. The Idaho Transportation Department (ITD) is currently accepting comments on the options in their draft Environmental Assessment (EA) for reducing wildlife/vehicle collisions on Targhee Pass on Idaho’s Highway 20. The Greater Yellowstone Coalition supports Alternative 2, which would utilize wildlife overpasses with fencing, because it does the best job at increasing driver’s safety, allows a secure path for wildlife as they move along their ancient migration routes, and is the most cost effective for the taxpayer. Targhee Pass on the western side of Yellowstone National Park is a high-volume area for migrating elk, deer, moose, and bears. Three of Yellowstone’s elk herds cross this highway to reach their winter and summer ranges. In 2015 a grizzly was killed on this stretch of road, and it is considered an important travel route for both wolverine and Canada lynx. A bull elk makes his way across traffic in the Greater Yellowstone Ecosystem. Now, we need your voice. ITD doesn’t want to build the safest road for people, and they don’t want to allow wildlife movement. Their preferred choice would only reduce wildlife collisions by 30% and provides no benefit for wildlife movement. Because we know these roads will be in place for a generation, it’s crucial that ITD hears from you today. Please submit your own comments to ITD on why safe highways for people and wildlife are important to you. Please reach out to me with any questions at amichalski@greateryellowstone.org. I’m happy to discuss Alternative 2 and the ways in which it supports driver safety and wildlife migration. Thank you for all that you do for Greater Yellowstone!